Aureolaria flava. Kitty Kohout.Robert W. Freckmann Herbarium, University of Wisconsin-Stevens Point. 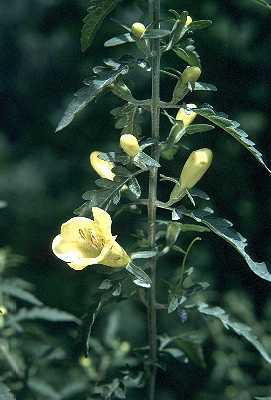 wisplants.uwsp.edu (Accessed 5/2014). Aureolaria flava is a perennial, root hemiparasitic herb, 1-2 m tall, stems smooth, waxy pale-green, often purplish, branched near top. Leaves opposite, lower leaves deeply, pinnately lobed, lobes widely spaced, often waxy pale-green, upper leaves toothed to smooth-margined. Flowers yellow, 3.5-5 cm long, broadly tubular, petal lobes 5, unequal, tips rounded, July-Sept..
Fruit dry, a capsule 1.2-2 cm oval.